Tunisian President Beji Caid Essebsi marched straight into a battle with Egypt's highest Sunni authority, Al-Azhar's mosque and university, when he proposed social and religious reforms giving women more freedom in marriage and guaranteeing them equal inheritance rights. A substantial part of that agenda became law last Thursday when Tunisia's parliament ended the ban on Muslim women marrying non-Muslim men. 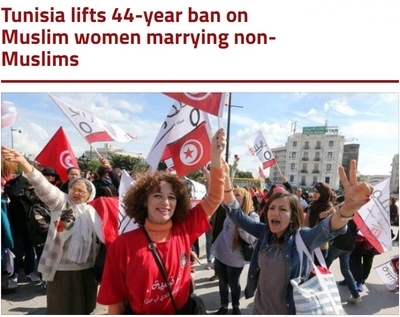 It is a direct result of controversial reforms Essebsi proposed, ending a ban imposed in 1973.This was done while proposing new law to secure gender equality in inheritance rights. Egypt's Al Azhar has ferociously condemned these reforms as un-Islamic, contradicting what it called the "Fundamentals of the Faith." Marriage to non-Muslims may harm Muslim women due to differences in faith and traditions and could lead to women being prohibited from practicing their faith freely, said Al Azhar Deputy Imam Abbas Shoman. Essebsi's proposals mark the first time the leader of a Muslim-majority nation personally announced critical social reforms, which also include giving women equal inheritance to men despite traditional Shari'a-based laws. These reforms aim for gender equality in Tunisia. Al-Azhar also opposes the inheritance changes, Shoman said, saying they contradict the Quran's guidance. "Allah instructs you concerning your children: for the male, what is equal to the share of two females," it says. Though not wielding the same influence as the Vatican Pope's over Catholics, the moral authority wielded over Muslims by Al Azhar's grand imam is recognized in all four corners of the globe. Al Azhar once represented a pillar of modernity and moderation in the Islamic world, but that changed when ultra-conservative Wahhabism and Muslim Brotherhood Jihadist doctrine ascended during the 1950s. More radical Salafi doctrines became part of the core curriculum. Essebsi's call for gender equality is a step toward a secular path, which is a radical departure from most predominantly-Muslim countries. It's not surprising, therefore, that it generated a storm of protest and condemnation from the Al Azhar sheikhdom (administration). To them, Tunisia's reforms counter straight-forward Quranic verses concerning the distribution of the inheritance between women and men and marriage to non-Muslims. Those verses dictate that a man receives twice as much inheritance as a woman. That's because men traditionally pay for the expenses of the house that includes the family's women until they get married and move into their own homes. Thus, a man should acquire twice as much as his sister or women counterpart to carry on with his duties. That mayhave made sense 1,400 years ago, but in the 21stcentury that is hardly the case anymore. Women have attained huge milestones in the past two centuries and even in the Muslim majority nations. For example, Egypt's feminist movement started in the early 20th century, and by the 1950s, Egyptian women had voting rights even before women in Switzerland. Egypt has a major representation of women in all political, economic and social fields. Countries such as Pakistan, Indonesia, and Turkey had a female presidents or prime ministers.Today, more than a third of Egyptian households are financed by women, the Egyptian National Centre for Social and Criminological Research (NCSCR) reports. The issue of Muslim women marrying non-Muslims has been a source of debate and conflict for centuries. Advocates of Tunisia's reforms argue that the Quranic verses governing marriage outside the faith apply to men and women. The only prohibition is marrying an atheist or a follower of polytheistic religions. Nevertheless, for more than 1,400 years it became the norm that Muslim women are prohibited from marrying non-Muslim men. Scholars argued Muslim women who married outside the faith might not be free to practicing their religion. Reform advocates believe that 21st century women freely choose their own life partners and are aware of any consequences. Renouncing Al Azhar's criticism, Essebsi condemned "foreign interference" in internal Tunisian affairs. Tunisian religious bodies, including the Diwan of Fatwa, support his reforms. Al Azhar Grand Imam Ahmed Al Tayeb was reputed to be a moderate Sufist who many in Egypt hoped would counter the growing influence of the university's radical alumni. Alas, he has faced criticism from liberal Egyptian intellectuals and secularists for blocking any tangible Islamic reforms. During his reign, Al Azhar has waged witch hunts against Egyptian Islamic reformers such as Islam Al-Beheiry. Al-Beheiry spent a year in prison for blasphemy because he dared to condemn some major Islamic traditionalist scholars' works, calling them the source of modern terrorist ideologies. He was later released after being granted a presidential pardon. More than two years ago, Egyptian President Abdel Fattah al-Sisi made a historic call for a religious revolution targeting interpretations and misconceptions of religious scripture that drives jihadist ideologies. Al-Azhar's sheikhdom met the call with defiance, despite displaying fake enthusiasm for the government and the media. As a result, no new laws have been introduced and no curricula have changed with Al Azhar's influence on Egyptian state affairs is growing stronger. Yet al-Sisi is not challenging the religious institution enough out of fear that the Muslim Brotherhood and Egyptian Salafists might use the pressure to restore their influence in Al-Azhar. However, a confrontation with Al Azhar seems inevitable since it has already been infiltrated by the very Salafists and radicals whose influence al-Sisi wishes to eradicate. Ironically, Tunisia's Muslim Brotherhood-affiliated Ennahda Party has been mostly vague about the social reforms. Despite the protest of some of its main leaders, no official statement has been issued Ennahda vice President Abdel Fattah Mourou said that marriage is a matter of personal freedom under Tunisia's constitution. Ennahda, which rose to power after the 2011 Arab Spring, was voted out just three years later. Now it is trying to appear as moderate as possible to regain its strength and weather the storm of anti-Islamist sentiment prevailing in many Middle Eastern nations. Essebsi is implementing reforms he deems necessary for his country's social progress. These reforms already are having a ripple effect in the region and might lead to further social progress. Essebsi has done what al-Sisi called for about for more than two years ago, but never took any tangible steps to implement. These reforms may be not exactly what al-Sisi wanted when he called for a complete change of Islamic rhetoric that shuns all forms of extremism and violence. Nevertheless,Essebsi's reforms are a bold step forward for total social and religious reforms that the Middle East desperately needs.